One of Henry VIII's 'great ships', Mary Rose, sank on 19 July 1545. 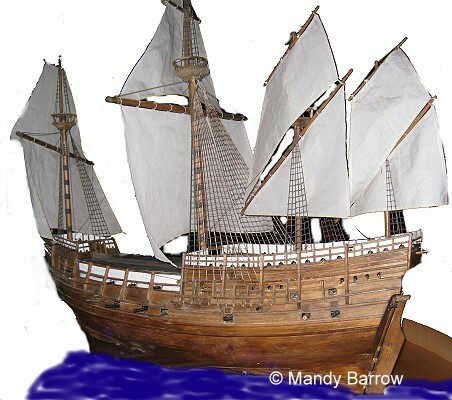 Why was the ship called the Mary Rose? King Henry VIII's named his favourite warship after his sister. When was the Mary Rose built? The ship was built in 1509, the year Henry VIII came to the throne. On 19 July 1545, disaster struck the Mary Rose. The French had landed on the Isle of Wight. Henry came to Southsea Castle to watch his fleet leave Portsmouth and engage with the French force in the Solent. At the head of the English fleet was his pride and joy the Mary Rose. From his advantage point on top of Southsea castle, Henry had a commanding view of the impending battle. Unfortunately, right before his eyes he watched one of the greatest naval tragedies, the sinking of his flagship, the Mary Rose. It is not known exactly what happened to cause the sinking of the ship, but one theory suggests that the crew fired the guns on one side of the ship and were turning the ship to fire the guns on the other side. Unfortunately, they failed to close the gun ports and a combination of this and the wind caused the ship to tilt, fill with water and sink. The Mary Rose sank within a matter of minutes with seven hundred sailors lost. The rediscovery in 1968 and submerging of the Mary Rose in 1982 has provided us with a unique glimpse of maritime life in Portsmouth during the reign of Henry VIII. The remains of the Mary Rose are now on display at Portsmouth Dockyard Naval Museum. 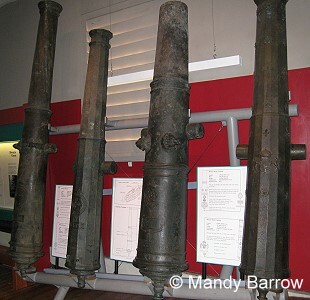 Below you can see some of the bronze guns recovered from the Mary Rose. Each one of them is uniquely decorated with royal devices, coats of arms and even Henry VIII's name. A great number of artifacts were uncovered during excavation, including navigational and medical equipment, carpentry tools, guns, longbows, arrows with traces of copper-rich binding glue still remaining on the tips, cooking and eating utensils, lanterns, backgammon boards, playing dice, logs for the galley's ovens and a total of ninety-one guns.